My plan is to make a quilt top each month, mostly from stash. I will reserve the right to purchase a few things to make it work, if necessary. Each pattern will be pretty straightforward and fairly simple. (Nothing new there!) And, I plan to share that pattern each month (any day I choose) here on my blog. It is my hope that this will inspire you to use your stash, too! I designed this quilt to showcase some of those big bold prints that I was hesitant to use because they were too pretty to chop into tiny little bits. I used 70 different prints, each fabric is only used once. In order to keep things somewhat orderly, I arranged the prints according to value. From light fabrics, cut 20 pieces 6.5" x 12.5" These are A pieces. From medium and dark fabrics, cut 20 pieces 6.5" x 9.5" These are B pieces. From medium and dark fabrics, cut 30 pieces 6.5" x 11.5" These are C pieces. From the A pieces, take 5 blocks and sew them together, horizontally, end to end. (See rows 2, 4, 6 and 8 in the photograph below.) Make 4. From the B pieces, take 10 blocks and sew them together, vertically, side to side. (See rows 1 and 9 in the photograph below.) Make 2. 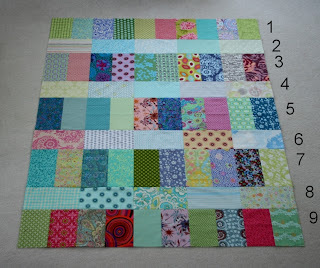 From the C pieces, take 10 blocks and sew them together, vertically, side to side. (See rows 3, 5 and 7 in the photograph below.) Make 3. 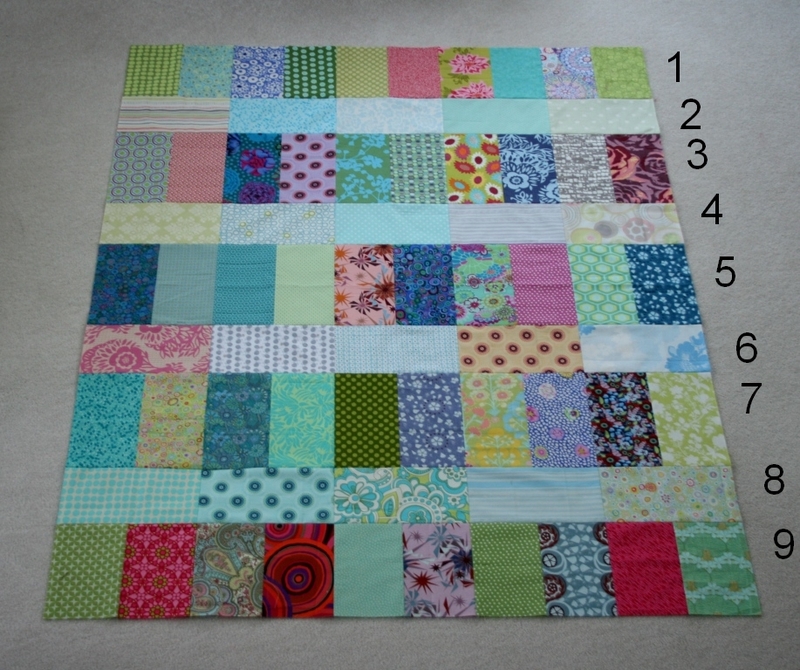 Sew rows 1-9 together and you have a completed quilt top. Baste, quilt and bind as desired. Then wrap up in your pretty new quilt! This is a 100% stash quilt. Yay! But I didn't even begin to make a dent in my stash. Boo! However, it is a step in the right direction! I hope you like this one as much as I do. If you make a quilt using this pattern, I'd love to see it. There is a serious disconnect between my stash and how I decorate my home. I've known this for quite some time, but for some reason, it's been bugging me lately. In contrast, this is a photo of my couch. The pillows are made from the Glace line by Moda. Anything by French General or 3 Sisters would fit perfectly in my home, but I certainly don't stash (or rarely even buy) that fabric. Instead I buy bright orange and aqua. Yellows, pinks...anything bright. Does anyone else have this problem? It just seems a bit strange to me. Thanks for all the excitement about the new Moda Bake Shop book, Fresh Fabric Treats. The winner of a copy of the book and a layer cake is epban. Thanks to everyone for playing along! Last Friday the temperature here was -22 degrees F. Can you say FRI-GID? It is no coincidence that I found time to finish up a pair of hand knit socks over the weekend. This is my 5th pair! I love hand knit socks! These are made from Alpaca yarn, which is incredibly soft. They feel wonderful on my always cold feet. It is also no coincidence that I started knitting a pair of mittens. Easy peasy. These are so soft and smushy. I'm going to love wearing them! I also found time last week to crochet this scarf. It went QUICK! I was done in about a day and a half. I love it! Hurray for crochet! If you are new here, let me introduce myself....I am Amanda Jean aka Crazy Mom. I have 3 young children and a wonderful, supportive husband. I quilt rather obsessively. I've been at it for 10 years (can it be?) and I love it more every year. I have recently started teaching quilting classes and I love to design my own quilts. 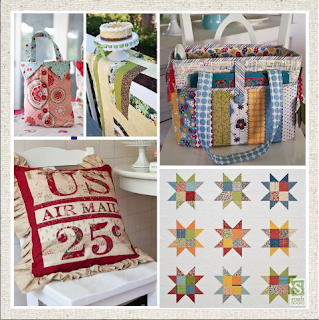 A few of my favorite MBS quilts are here, here and here. Since this is a progressive dinner, here's a little recipe for Stromboli for you. I know it's early in the dinner, so I should be serving up an appetizer, but I'm skipping right to the main course. This is one of my family's favorite meals. Serve it with a green salad and cottage cheese. Oh, and don't forget some marinara sauce for dipping! Yummy for all! We actually had this for dinner last night. Let the dough rise according to package directions. Roll out dough on lightly floured surface until it is about 14'' x 18''. Layer the ham and pepperoni on the dough, top with Swiss cheese, sprinkle with Parmesan cheese, oregano and garlic powder. Roll up like a jelly roll and pinch the ends and edges to seal. Bake in a 350 degree oven for 30-35 minutes. Let cool slightly. Slice and eat! Ok, now let's talk a little more about this book and the prizes! Here's a sneak peek at a few of the projects that are included....see that quilt on the lower right? That was designed by me! I'm so thrilled to be a part of this book. (It's still hard to believe.) It's fun to finally be able to talk about it! If you would like a chance to win a copy of the book AND a layer cake (specific fabric line to be determined), please leave a comment here on this post. The book is scheduled to release in late April or early May, so you would receive both prizes at that time. If you would like a chance to win a fat quarter bundle, a fat eight bundle, jelly roll, layer cake AND a charm pack (over $200 value! ), be sure to visit and leave a comment at every author's stop of the progressive dinner. 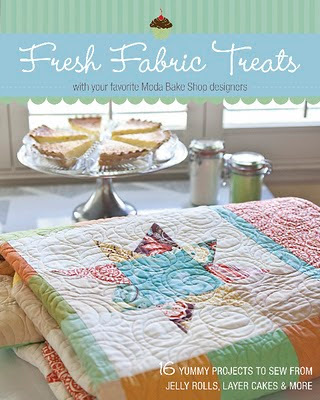 I'll pick the winner of the layer cake and a copy of Fresh Fabric Treats on January 27th. Good luck! These were made from white Kona cotton and lots of pretty scraps...many of which came from Terri. Thank you, friend! The tutorial is here. I loved it then, I love it even more now, in a scrappy version. I love free piecing, but once in awhile it's a good exercise to do some precision piecing for a change. My 1/4'' foot helps! Doh! I just noticed an error in one of the blocks. Can you see it too? Cheryl is relaunching her Workshop in Progress series this week. (You can read more about it here.) I am joining in. Truthfully, this isn't easy for me. It feels like I'm putting a lot of myself out there...and some days that's easier than others. Today it feels like a stretch. But I love the concept of this workshop and I do need some input. Remember my gingham quilt? I really wanted to make gingham. I NEEDED to make gingham. Once the idea got in my head it took root firmly and I had to see it through. Know what I mean? Once I made the quilt, though, I could see that it needed something. I didn't expect to use this as a background fabric, but that's where I'm headed. I'd like to applique a large daisy on it. I wanted to see what it would look like before cutting into fabric, so I used paper instead. It's handy, because the paper pieces will serve as my templates when I make the applique pieces. My dilemma is...the daisy is just sitting there floating on the surface. Does it need some design element to anchor it to the background? I don't really want to do a large stem. I thought about adding on a few smaller daisies (for a total of 3) and maybe having one go "off the page". But they would still be floating on the surface. I'm stuck. Do you have any thoughts? Suggestions? I love having options! And I LOVE this bedding set! My husband doesn't mind florals. Hurray for that! This was going to be my summer look, but this is such a nice contrast from these short dreary winter days. The winner of the very small scraps that would make an excellent Ticker Tape quilt is Korbi! I've added a bunch more to the lot during this past week and I'm glad that they will be going to a new home. Thanks to everyone for playing along. I'm glad to know that I'm not the only one who saves and LOVES scraps that much! This is my Topsy Turvy quilt. I made the top back in May or June. I finished it in August. The tutorial went up on the Moda Bake Shop in December, and here it is, January, and I'm finally blogging about it. I used to be more on top of things than this! Sheesh. This is a super duper easy quilt to make...all you need is a layer cake, a few yards of fabric for the top and a 12 1/2'' ruler for easier construction. It's perfect for a beginner. This would be a great pattern to showcase some large loud florals, although I do like it done up in these soft and subtle colors, just for a twist. You can find the tutorial here. By the way, doesn't my bed make a lovely quilt holder? Did you see that DeeRoo is leading Round 9 (!!!) of the Old Red Barn quilt along? She is doing variations on a theme...and the theme is Ticker Tape. I have a bunch of small scraps...and these would be perfect for a Ticker Tape quilt. I'm going to give these scraps away to one reader. There are lots of scraps! I love this time of year. The new year holds all kinds of promise and the thought of a fresh start. It's a time to breathe for a bit before things get crazy. Again. I'm enjoying the (relative) calm while it lasts. I've enjoyed reading so many new years blog posts...what a fun thing to reflect collectively on the past year and look forward to the new one. I finished 26 quilts, which is quite moderate for me. Yay for moderation! I did more teaching/speaking in 2010, which I love. It also opens the door for all new levels of insecurity. But, hey, what do you do? It's good to be stretched out of my comfort zone. At least that's what I tell myself. :) It's so fun and rewarding to share the love of quilting with others. I have a lot of hopes for this year. I hope to teach more. I hope to use more of my stash. (Isn't that the same every year?) I hope to stash less fabric. (I'm afraid that this just may remain a hope and not a reality.) I hope to use tons of my scraps. It was revolutionary for me. Because when you quilt (and blog) there is so much pressure to make what will impress...to continually come up with something new and stellar...to reinvent the wheel, so to speak. It's hard to do that when there is nothing new under the sun. For me, while blogging, it's hard not to be competitive. (I won't delve into this topic further, it wouldn't be pretty.) But having permission to do what I want to do, quilt wise, now that is refreshing. I really, really hope I can make this happen. Quilting will be a lot more fun! So that is my one and only resolution for the upcoming year and I'm excited about it. Happy New Year to you! Thanks so much for reading. I so appreciate it!